Telerik.WinControls.UI.Design is the design-time assembly responsible for the proper rendering of Telerik UI for WinForms in the Designer. When viewing controls from the designer, Visual Studio tries to resolve the corresponding Telerik.WinControls.UI.Design. If the assembly is not in the GAC, controls dependent on it will not be visible when added from the toolbox. Designer in Visual Studio 2010 SP1 showing errors when a design assembly is missing. To ensure proper design time support the design assembly is added to the Global Assembly Cache during installation from where Visual Studio can later resolve it. When the Telerik Project Wizard offers you available distributions to choose it also checks whether the design assembly is in the GAC and in case it is not, the wizard adds the corresponding Telerik.WinControls.UI.Design from the selected distribution to the GAC. Elevated privileges are required to add an assembly to the GAC. 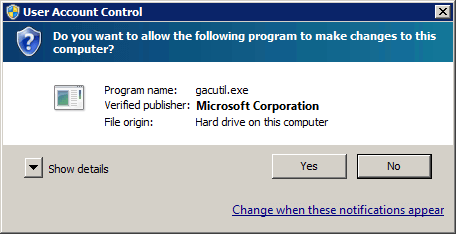 In case your machine has User Account Control enabled a permission dialog will appear later in the wizard and must be confirmed. The design assembly comes along with the distribution of control assemblies. If the distribution was downloaded through the extensions it can be found in %APPDATA%\Telerik\Updates.